Select a smooth bottomed cage (no wire bottom, ramps or shelves on which they can catch their feet). A small covered house or box inside the cage with multiple entrances will provide a sense of protection and a place to sleep. 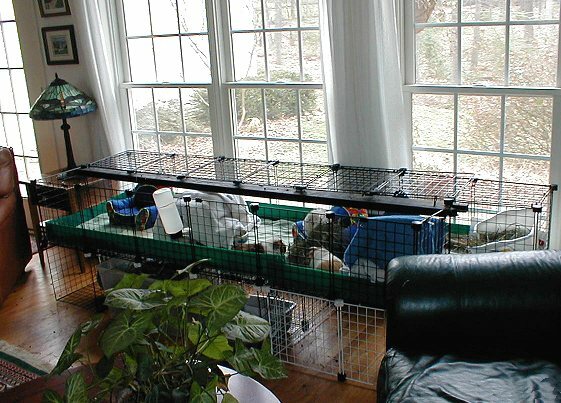 If separation from other household pets is not an issue, an open-topped enclosure may allow you to interact with and pet your guinea pig more easily. Never house guinea pigs with other species (rabbits, for example). As a general rule, they should not be allowed to interact with your other pets. We have read many sad stories about guinea pigs killed by dogs. Cats can be predators too. 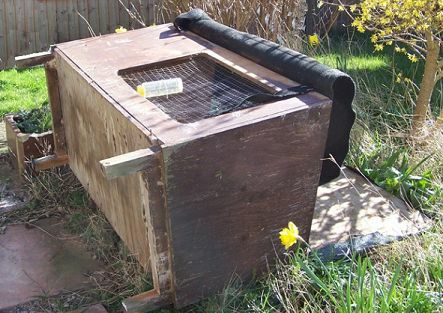 Remember that guinea pigs are prey animals so if you have other pets in the house, a sturdy cage top is recommended. SIZE: Provide as large a cage as possible. Guineapigcages.com makes a compelling case for providing 7 square feet for one guinea pig, adding 2 to 4 square feet per additional guinea pig and offers creative, attractive, and affordable ways to do so. Visit Guineapigcages.com for plans and designs. A larger cage will require less frequent cleaning and provide space for play, toys and exercise. Many pet owners report happily popcorning pigs when introduced to their new, spacious living quarters. And more space makes "getting along" easier for multiple pig households. In the U.S. you can now purchase a C&C Cage Kit online, if you'd like the planning done for you. Part of the cost helps to support the Guineapigcages website. The author has given her three pigs free run of a whole room and includes photos and a description of their living arrangements (see: My Guinea Pigs And Their Home). Planning on making a Creative Cubes cage? Not all wire grids are the same! Be absolutely sure the maximum spacing for your cage grids is 1 1/2". Adult guinea pigs have gotten stuck and died in cages using the new larger grids! 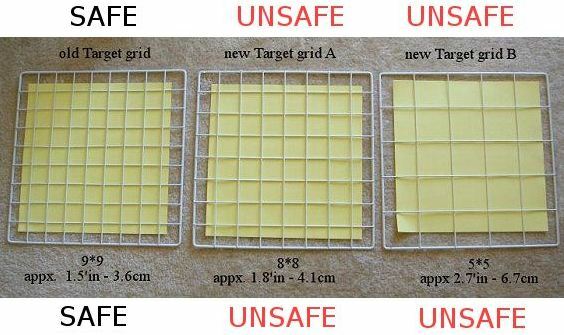 The smaller "safe" grids can also be dangerous for young guinea pigs. While your pets are young and small, use mesh style grids or securely line the walls of standard grids with spare corroplast, plexiglass, or cardboard. Find below a comparision of old and new grids. DO NOT USE EITHER SIZE OF THE GRIDS WITH LARGER OPENINGS TO BUILD GUINEA PIG CAGES! And view the educational mini-video (a 2.5MB mov or smaller 0.3MB wmv file) describing why guinea pigs need a large space. Choose a bright draft-free room with a stable temperature range between 65 and 75 degrees F (18 to 24 degrees C), out of direct sunlight, situated close to household activities. The more your guinea pigs are part of your daily lives, the happier you will both be. Avoid bedrooms: allergies may develop in families prone to problems when you or your child sleep in the same room that houses your pets. And if a bedroom is not a frequently used activity area, your pet may be forgotten. Do not house your guinea pigs outside: Temperature fluctuations can be very hard on your guinea pigs. 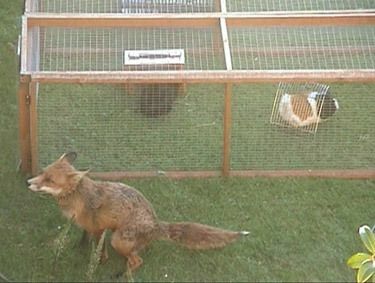 Predators sometimes break into cages. A guinea pig inside will receive better care as you will catch health problems more quickly. This unoccupied hutch was blown over by high winds. WARNINGNever leave a guinea pig unattended in the presence of a dog, cat, ferret or any other predatory animal. This fox was photographed in Scoot's garden. Cover the cage floor with 1 to 2 inches of Care FRESH or Yesterday's News (paper products) , aspen shavings, or kiln-dried pine. Frequent changing (every 3 or 4 days or less) will prevent odors and promote good health. Provide a water bottle and a small, heavy untippable dish for pellets. A hayrack, hammock, cat toys with bells, Pigloo, or a non toxic hanging bird toy.You may also wish to purchase a cat carrier for bringing home your pet and transport to the veterinarian. Tracis constructed a wonderful light, airy cage with hayloft and ramp. 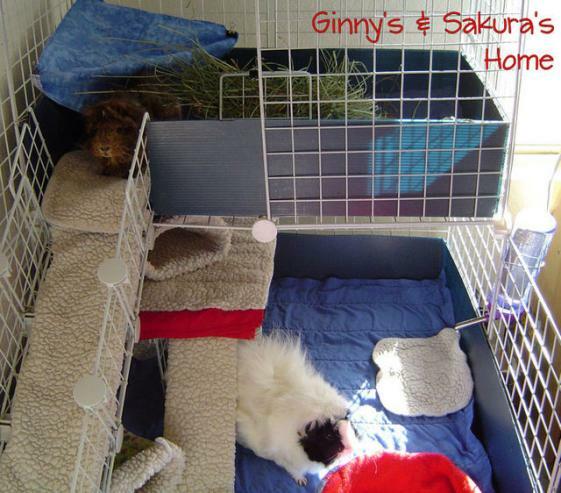 She illustrates Building Ginny's & Sakura's Cage (with photos) on the Forums.